If you’ve spent some serious time with Overwatch you’ve likely noticed some heroes getting much more play time than others. 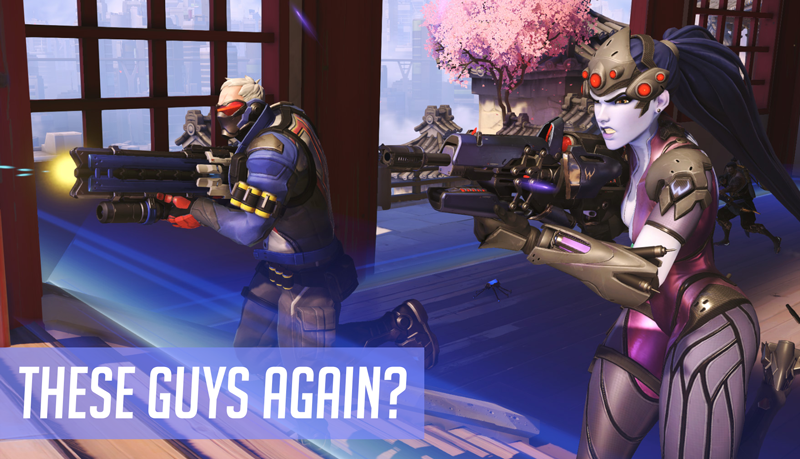 Whether it’s a whole team of Bastions or a single aggravating Widowmaker, not knowing how to counter a character can be frustrating for any player new to Blizzard’s team-based shooter. One of Overwatch’s greatest features is its option to let players switch characters on the fly. Not feeling the genius gorilla? Switch to the cyborg dwarf! It’s a mechanic that can make every match feel exciting and unpredictable. The suggestions below are focused on how to combat some of the most popular and/or seemly unfair heroes that you’re certain to encounter more often than not. Not every counter is going to be a less popular character, and it should be noted that a good handful of counter picks are some of the same overused heroes that made our list. Overwatch is a game where any player can gain the upper hand by using their abilities in precise or creative ways, as well as focusing on teamwork. If you’re looking for a more detailed breakdown of every single character in the game I highly recommend you check out our official Overwatch tips and character guide. **UPDATE** - I’ve tweaked a few characters and included a “Reader Suggestions” section for each. Thanks to everyone who spoke up in the comments with their best strategies. How To Counter: Though many consider Bastion the cheapest player in the game due to his turret form and ability to heal himself, he’s far from unbeatable. Luckily for opposing players both of these seemingly overpowered abilities have the same weakness - they temporarily immobilize the bird-loving robot. If you want to challenge Bastion head on your best bet is Genji, a character who can reflect bullets back at Bastion with his futuristic swordplay. Tanks like D.Va and Reinhardt can bring quick cover to a teammate attempting to bring Bastion down, but they’re more of a distraction than an actual counter. Be sure an alley is nearby to dole out some damage if you choose the tank approach. For more stealthy close range combat you should look towards characters like Tracer and Reaper, who can materialize behind Bastion and do some serious damage. If you’re not keen on potentially becoming riddled with bullet holes you can always spring for Widowmaker or Hanzo. Set up shop out of sight and let fly a few devastating shots to dismantle everyone’s least favorite “Play of the Game” winner. Reader Suggestions: Both Junkrat and Pharah have the firepower to make short work of Bastion. Just be sneaky! Others suggest Roadhog, who can use his chain hook to take Bastion out of turret mode. How To Counter: Everyone’s favorite Aussie peg leg sure is annoying. Chances are you’ve encountered a Junkrat or two who will spams his trademark grenades until he racks up enough points to send Rip Tire rolling into battle. Then it’s time to run for your life (or take it out before it goes off if you’re feeling ballsy). It can certainly be frustrating. Junkrat’s grenades may be powerful, but they’re not the easiest to aim at long distances and they have a bit of a kickback. If you’re far from an opposing Junkrat you should approach in a serpentine pattern of sorts to throw off his aim. Getting up in his face is the way to take him down. As mentioned in Bastion’s guide, Tracer and Reaper are your go to when you need to approach with surprise. Heroes with explosive close range firepower, like McCree, Pharah and Roadhog, are also a solid choice. Just be sure you don’t walk right into one of Junkrat’s patented bear traps while you try to avoid his blasts. Reader Suggestions: Snipers like Widowmaker and Hanzo can gain the upper hand on Junkrat from afar. Torbjorn can also be handy, as his turrets can take out Junkrat’s wheel of doom before it reaches anyone. How To Counter: Widowmaker is the only hero in Overwatch who can scope in on her targets. This can make her a very advantageous character to have on one’s team. Chances are you’ve stumbled upon a Windowmaker, focused intently on some far off foe, and gleefully taken her out from close range. Unfortunately, most smart Widowmaker players will do their best to keep a distance at all times. If you do manage to get close, chances are you can put a hurting on her. If you’re lucky enough to spy Widowmaker before she takes aim you can rise to her level with the right characters. Estranged ninja brothers Genji and Hanzo can both climb walls (though Genji is better for up close combat), while other heroes like Winston, Pharah and D.Va can take a vertical leap to get a better vantage point. Widowmaker does have one of the lowest health pools in the game, so it won’t take much to deplete her life. Reader Suggestions: From a defensive position Reinhardt can do a lot to slow down a Widowmaker kill streak due to his shield’s ability to take quite a few of her shots before shattering. How To Counter: Soldier: 76 is one average G.I. Joe. But that’s why everyone feels so comfortable with him. He’s the safest choice for newcomers; thus his appearance as the default Overwatch tutorial character. It’s no wonder he seems to be popping up in most matches on one side or the other. Due to Soldier: 76's all around average abilities there isn’t really one hero that stands out as his best or worst match up. Just about any character can make a dent in his armor if they play to their specific strengths. As 76 has the capacity to both sprint and heal himself (as well as others) it’s a good idea to stay on top of him as a team. If you’re after him solo you’ll want a more agile fighter like Genji or Tracer on his tail. Lucio’s ability to increase other players’ speed can also be a helpful buff when trying to keep up with 76. Just stay clear of his special, as it will lock onto any opposing characters in sight and take them out. Reader Suggestions: Soldier 76 can’t run if he’s stunned. Try Roadhog’s chain hook or Reinhardt’s special to slow him down. How To Counter: Two guns are always better than one, and Reaper regulars are well aware of this. The popular specter of death is handy for surprise attacks due to his Shadow Step, which allows him to mark a spot and warp there on command. Look out! Behind you! To excel against the king of angst you’ll need to be able to take a hit or be able to stop him dead in his tracks. When it comes to knock back there aren’t many better than D.Va and Reinhardt, both of which have fast acting shields and a solid amount of health. On the other hand, characters like McCree and Mei can faze Reaper long enough with stun and freeze abilities to leave him defenseless to their more powerful attacks. Just be sure to time your assault precisely, as Reaper’s wrath form makes him momentarily invulnerable. Take fire once he’s back to his vulnerable solid self. Reader Suggestions: Players have found that Pharah has a good advantage over Reaper with her explosive attacks and maneuverability. How To Counter: Roadhog is one big pig. His shotgun blasts and chain hook make him one of the most satisfying characters for newbies and a constant aggravation for everyone. With a large health pool and a healing ability to boot he’s not the easiest opponent to put in the ground. Roadhog is another character who doesn’t really have a definitive group of heroes who can counter him with ease. Chances are you’ll be best off with other tank characters who have high health to begin with, such as Winston, Reinhardt, and D.Va. Even another Roadhog isn’t a terrible idea. If you want to keep your distance you should lean towards Torbjorn. With a well placed turret and armor packs on tap, Torbjorn can help himself and others stay alive long enough to turn Roadhog into bacon. Reader Suggestions: Many have stated that Mei is a wonderful counter to Roadhog, as he is a the perfect target for her icy blasts. How To Counter: No one is quite as intimidating as a towering robo-knight wielding a gargantuan hammer. Reinhardt is one of the largest and most powerful close combat heroes in all of Overwatch, but it’s his enormous rectangular shield that has most players cursing their luck. The first thing you have to understand about Reinhardt’s shield is that it isn’t invincible. Anyone who has played as the hulking behemoth knows that his Barrier Field has its own health stats. Heroes with superior firepower, such as Pharah and Bastion, can shatter the shield in no time if they focus their fire. Just be sure to keep moving if possible so Reinhardt doesn’t have time to line up a direct hit with his rocket-powered charge. Defeating Reinhardt in a stealthy fashion is all about timing and position. Wait until his back is turned and then fire off long range attacks with heroes like Hanzo, Widowmaker, and even Junkrat. Reader Suggestions: Anther tank and another Mei suggestion. When Reinhardt is in his shield mode he’s the perfect target for a frigid blast. Tracer and Genji can also use their speed to get beyond his shield and attack him from behind. Obviously your Overwatch experience may differ. Who knows, you might not even be seeing the seven characters listed above very often. If you’ve found a handy way of dealing with a specific character that was causing you grief we’d love to hear about it in the comments.